Covering an area of over 8,600 acres, the Hickory Creek Wilderness is one of only two specifically designated wilderness areas in the state of Pennsylvania with the entirety of its property located within the state borders. 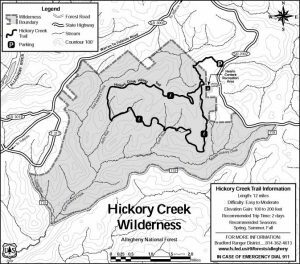 It was designated Hickory Creek in 1984 by Congress, and it is currently part of a system of 109 million acres of land protected under the National Wilderness Preservation Act of 1964 while being managed by the state’s Forest Service. Located within the Allegheny National Forest in the northwestern part of Pennsylvania, the Hickory Creek Wilderness boasts lush and dense wooded areas abundant with northern hardwoods and hemlock as well as a forest floor of flowers, ferns, shrubs and mosses. Wildlife within the designated wilderness area includes relatively high populations of bear, deer and wild turkey. The wilderness also supports a 12-mile loop of a hiking trail with a dedicated trail head located off State Route 2002, accessible only on foot. There are many other conditions to follow regarding “Leave No Trace” techniques, all of which are accessible online. The Wilderness Act of 1964 was designed and signed into law for the purpose of preserving select areas of nature “where man himself is a visitor who does not remain.” In the interest of maintaining some form of wilderness for generations to come, Congress had designated the 100 million plus acres of land protected under the Act for the sake of protecting it from development on any urban scale “for the permanent good of the whole people.” While the wilderness areas can be utilized and enjoyed for recreational purposes by the general population, the Act only allows development within the areas that could benefit and enhance these recreational activities while still maintaining the general integrity of the nature and inlaying ecosystems. Under this Act, wilderness areas like the Hickory Creek Wilderness within the Allegheny National Forest can endure and thrive amid urban development and modern-day commercialization of the United States, allowing consumers to enjoy such wild and natural areas for years to come.